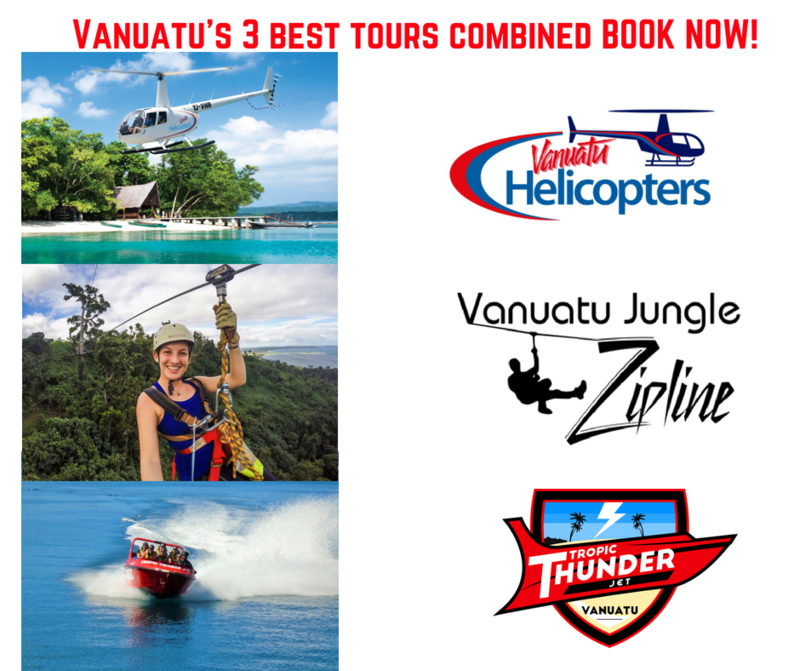 A Helicopter ride to get you off to a flying start, then soar through the trees on our TreeTop Canopy Tour Zipline before getting soaked in the fastest Jet boat in Vanuatu. Do all three in one day or over a couple of days. Helicopter flight by Vanuatu Helicopters. A free Glass bottom boat tour will get you out to the waiting helicopter on Vanuatu’s only floating Heli Port in the beautiful Port Vila Harbour. Once airborne you will see why their motto is “A Better View of Paradise”. The colour in the reefs come alive as the helicopter ascends above them; keenly keep watch as you may see the resident dugongs and turtles. The helicopter will cross over Hideaway Island so you can spot the underwater post office before swinging around the Cascade Waterfalls and landing in the gardens high on The Summit beside the Zipline departure point. Tropic Thunder Jet is Vanuatu’s fastest Jet boat experience. This tour is called “the Wetter the Better” and it gets your heart pumping full of adrenalin as the skilled driver races the boat across azure blue water and into the shallows of the reefs. Hold on tight because the boat can do a 360 degree spin at full speed. The Skipper will slow things down occasionally and talk to you about the local sea life and villages you see along the way but not for long as it’s time to push the pedal to the metal and unleash the power of the V8 engines… It’s a Thrilla in Vila. An epic and unforgettable day! Minimum booking of 2 people. What to bring for Zipline: comfortable clothing (no short shorts or dresses), closed in shoes (if possible), bottle of water (can buy at Summit), and your camera, smart phone or GoPro. Included on Zipline: transfers from the Seafront to The Summit Zipline, rain jackets, lockable gear storage, pouches for smart phones.